The biggest story from Cabrinha this year is the revolutionary new Fireball connection system. All of our control systems are still available with a quick loop, traditional opening harness loop system. But also now with the Fireball connection system, which gives a couple really key advantages to riders of all levels, beginners and pros and everything in between. The Fireball connection system is more comfortable because it brings the connection point much closer to the core, about five and a half or six centimetres closer, compared with a traditional hook spreader bar. And that means that there is less torque on the spreader bar, and much less tendency for the spreader bar to twist up or roll into your rib cage or your chest, and makes any harness more comfortable to ride. 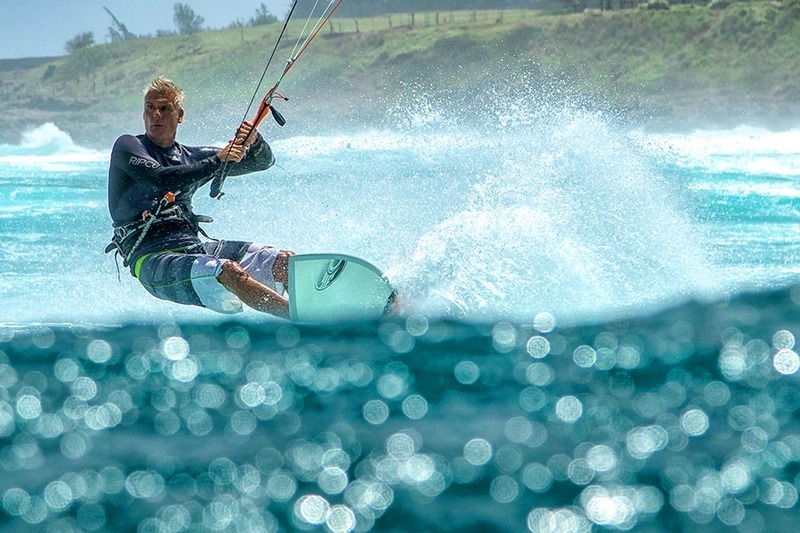 It also means that when you’re riding toeside or when the kite’s pulling from different angles, all around through 360 degrees, the less torque on the spreader bar is going to be a lot more comfortable. Besides comfort though, the Fireball also has advantages in its ease of use, reconnection after you’ve deployed the quick release, and it’s actually safer in the way that it doesn’t rely on the assumption that the free end of the opening loop will go through a spreader bar. In the case of Fireball, both sides of the connection point are designed and integrated into the system so that it will always release 100% of the time. And of course it meets the French norm and the other industry standards for the quick releases. So that’s Fireball, I definitely encourage you to have a look at it and hopefully you can get a chance to experience it yourself. It looks like it’s made for hooked-in riding, but it works just as well for unhooked? Well, the design brief is focused on hooked-in riding, but some guys, including former Australian freestyle champion Dan Sweeney, and from personal experience, reckon it actually works really well and has some advantages for unhooked riding. I would say unequivocally it’s almost not an argument that it’s better for hooked-in riding. For unhooked riding, there’s probably an element of personal preference. And it looks perfect for surf style. It’s absolutely amazing for surf style. And it’s gonna open new possibilities in terms of sliding spreader bars and allowing you to get more radical with your surfing because it’ll free up your hips a lot more with the system. One of the key advantages of Fireball is that it’s more comfortable and the main thing that makes it more comfortable is that it significantly reduces the tendency for the spreader bar to ride up on your body. When the kite pulls from above your head the spreader bar’s not going to pull up into your chest or your rib cage. It’ll make any harness more comfortable. So it won’t actually pull your harness up as high as the other traditional chicken loop? Yeah, it’ll let your harness sit more comfortably in the position that it’s intended to when you put it on. And also when you’re riding toeside, a traditional spreader bar hook will allow the pull from the kite to actually twist and spin the harness around on your body if it’s not super tight, whereas the Fireball connection is much closer to the body, much less leverage on the spreader bar and much less of that spinning of the harness. It’s just a lot more comfortable riding toeside and what you were talking about, all the pulling from above your head. 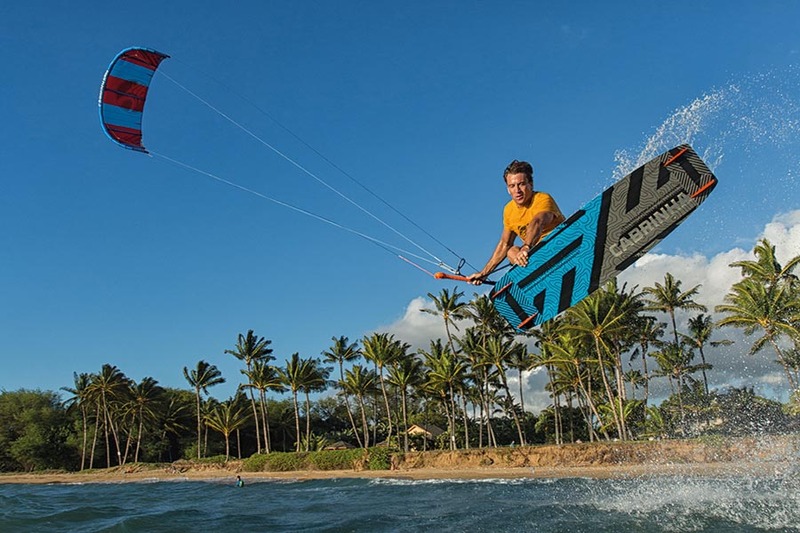 So the Apollo is an all new kite from Cabrinha that really takes kite design out of the box. It’s unlike any kite on the market today. Really high aspect ratio and really flat. So it generates a ton of power. A much larger percentage of the square metres of the kite is working to generate power, it’s very efficient. 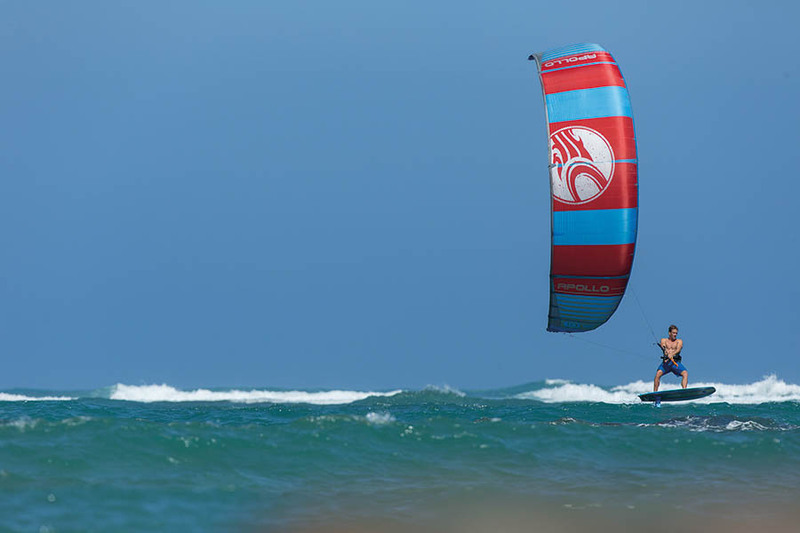 It goes upwind amazing angles, boosts and hang time like nothing else. It’s a really unique feeling, it feels a little bit like a performance foil kite, but with the advantages of an inflatable kite structure: the simplicity, the cost advantage, and obviously the confidence when you drop it in the water that you can get it back up in the air. Is it made for super light wind days? It is gonna work well in light wind conditions, particularly with a foil board, because it is so efficient. It doesn’t have as much raw power run than a kite like the contra which is more powerful, but the Apollo will definitely be an option for lightweight riding and also has top-end wind range as well. Pretty unique, definitely something that’s hard to miss when you see it flying in the sky it looks like a ribbon! It’s amazing. It just feels really unique. I think a lot of people that are loving their free riding, boosting, foil boarding, Recreational racing I think they’ll really enjoy it. Let’s talk about the Drifter. So the 2017 Drifter now comes in an all new 12-metre and 10-metre sizes, which are gonna be great for those riders that previously had to make the tough choice between the 13, 11, and 9, which are still in the range of course. Also something that we introduced in 2016 that was new last year and carries through on the 2017 Drifter is the off-shore and on-shore bridle settings. One of the main characteristics of the Drifter is it’s amazing drift, hence the name. And its ability to stay in the air and almost float with very little or no tension on the lines when you’re surfing the wave, really allowing you to use your board and the power of the wave to surf. Part of what makes the Drifter drift so well is that it sits quite far back in the window. This is great in on-shore conditions and side-shore conditions and particularly when you’re riding a surfboard. But in those conditions, particularly that they’re doing more and more competitions on the World Tour, and guys are getting out in waves where the wind is blowing from an off-shore angle, you want the kite to actually sit further forward in the window. And by moving these two knots on the side of the bridle from the on-shore setting which is what it ships in, to the off-shore setting, you allow the kite to sit a little bit further forward in the window. 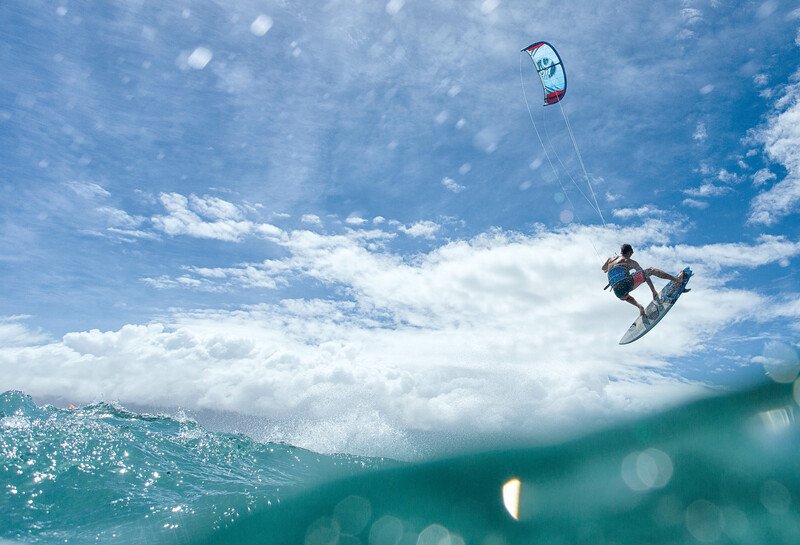 That just gives you a little more top end control and ability to really hit the lip a bit better when the kite would otherwise be pulling you off the back of the wave. It also means that for anybody riding a Drifter sometimes with a twintip, the off-shore setting allows the kite to sit further forward in the window. It actually goes upwind quite a bit better and is more controllable and has better top-end for riding with a twintip as well. So it really opens up the range of use of the Drifter a bit more. I definitely encourage people to give it a shot and recognise the difference in the feeling and the balance between that top-end control and lighter bar pressure and better upwind angles due to the kite sitting further forward in the window, but with the compromise being a little bit less drift characteristic and not quite as direct turning. Definitely still the classic Drifter in every sense, but with a new range of use due to that off-shore bridle setting, which is pretty simple to tune on the beach. That sounds like a great feature! Ok and twin tips? The 2017 Ace is all new in the Cabrinha range, or an all new redesign. It features a little bit wider tips and a bit more parallel rails, which gives the board a bit more pop, a bit more power and drive and upwind ability in light wind. It’s now also got an updated laminate with basalt laminate, which makes it the lightest board in the Cabrinha twintip range, and also 10% stronger than last year, which is great. It comes in two new sizes, a 131 for the smaller riders like kids and ladies, and a bigger size, the biggest size now being a 141. So in all there’s the 131, 133, 135, 137, 139, and 141. So six sizes of Ace. It’s definitely a standout all around free ride twintip that will excel at any kind of free style, boosting, cruising, great upwind, good flex, comfortable in choppy conditions, and a really nice all around board for 2017. It’s also now available in two colours – orange and blue. The 2017 surfboard collection from Cabrinha features all new shapes, all shaped by Pete Cabrinha himself, and probably the highlight board, specifically for Australian conditions, looks like it’s gonna be the Spade. It’s got a lot of characteristics of the super popular Skillet from previous years and it’s gonna be just a great board for all-round surfing conditions, strapless free style if you’re into that. All the surfboards this year are much lighter but even stronger with superior materials. Check them out at your next local demo! Cabrinha 3d FX – Nick Jacobsen shows us more!